Teaching young children at home outside of school hours can be tricky. It is great to use this time to keep them engaged in things they have learned at school as it will keep their mind ticking over and thinking about the new information. However you also don’t want to bombard them with school work and make it feel like a chore, there are a number of ways in which you can make it fun and not feel like work at all. You might even enjoy yourself taking part in these activities and have a trip down memory lane! Getting involved with kids learning is something that is always encouraged with parents. However some shy away from this as they feel they might not be as clever or can’t find fun ways of teaching, but there are so many resources and products out there that learning can be easy to make fun. The word art can sound a bit dull in the adult world, thinking of those boring galleries that you don’t understand. However art with kids means getting out a whole bunch of art and craft supplies like poster paint, glitter glue, felt tip pens, colored card and much more. No matter what you create from a poster with the times tables on to a recipe card of how to make cakes, using bright colors and other bits and bobs will make things much more appealing. You could encourage your child to read out the timetables as they draw them so the information is going into their brains without them probably realizing. Leading on from creating a colorful recipe card, you can then transfer this step into actually baking and making things in the kitchen! This is a place where some can get wary about introducing kids, visions of flour flying about the place and icing sugar clouds turning the counter-top into a vision similar to snow can be a scary thought! 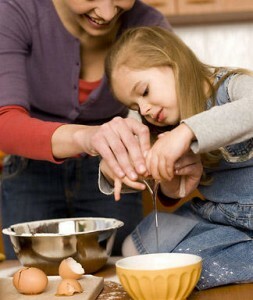 As a responsible adult though you can help your child along the way and help them to work up their skills so one time they are allowed to pour the flour. Learning recipes will not only help with essential skills in the future but reading the recipe will help with their understanding of metrics too. Keeping with the more creative theme I lead you onto dancing. Exercise for some children doesn’t seem like a lot of fun, I know I was never a fan of it! However dancing and listening to music from a young age might encourage them to enjoy it. You don’t realize how much exercise you do when dancing sometimes, and it will help them with their rhythm which will come in handy if in the future they decide to take up a class or even a musical instrument. It could also be a great way of introducing them to your classic song collection, great for when they go to pub music quizzes far in the future! These are just three ways that you can encourage learning in a creative and fun way, that you can enjoy too. They will pick up skills and be able to build upon them whilst also strengthening the relationship you share, a winning situation all round. I love finding fun and creative ways to teach my kids! It makes it more fun for all of us! We love exploring in our house! My kids take turns helping me cook, we often do crafts, but we spend a ton of time outside looking for new birds or bugs or plants! our recent discovery- Mulberries! They kiddos love them! My son loves to bake with me! Thanks for the post! My sons have no patience for me, but I think I am just not making learning fun enough!